Double-Click any photo for a Double-sized copy; Click BACK in your browser to return to this page. 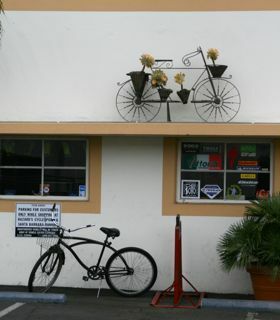 If you would like any photo sent as a higher resolution image to be printed, just e-mail me the Image Number from the larger copy, no charge to those on the trip. 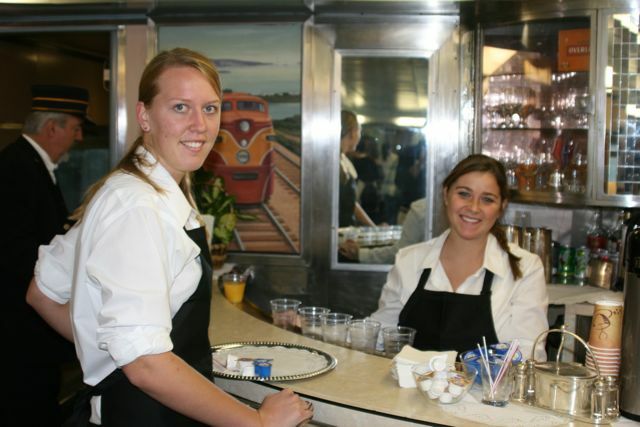 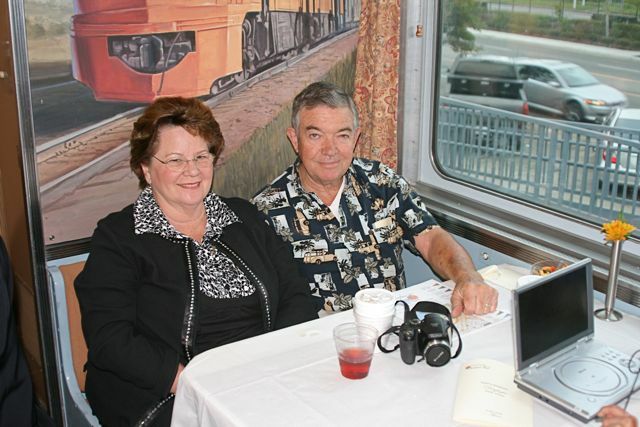 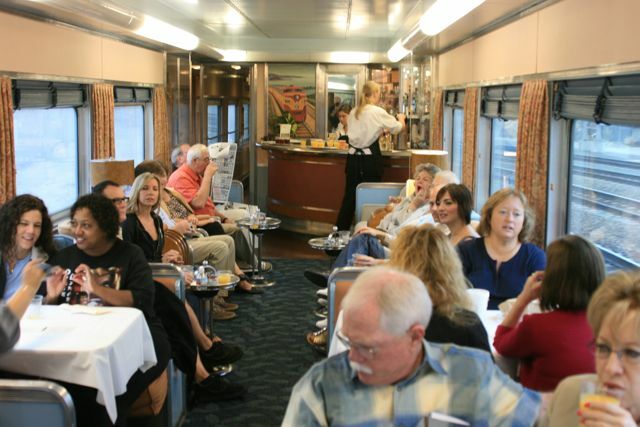 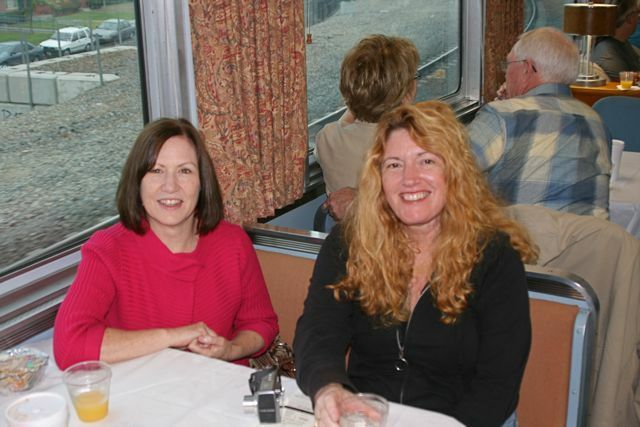 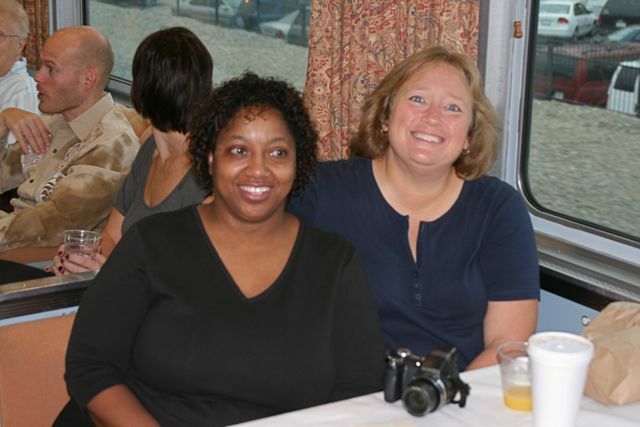 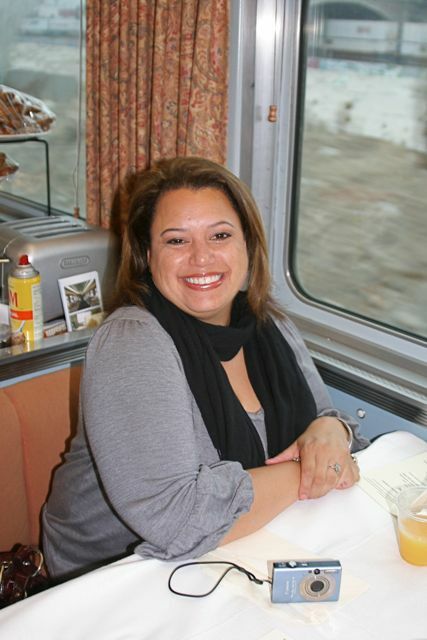 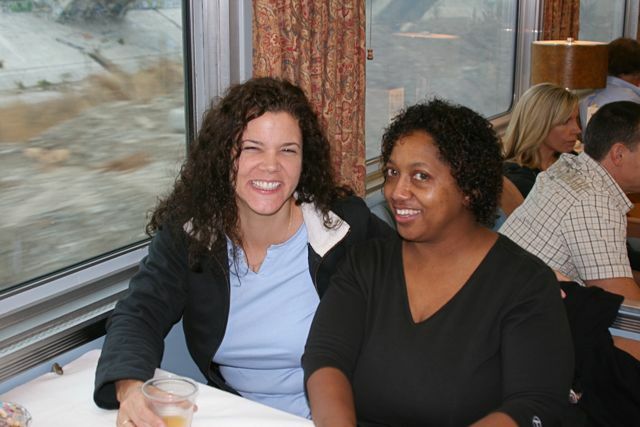 There was a near-capacity crowd of train and wine lovers who boarded in Los Angeles Union Station at 7:30 a.m.
Bill and Debbie Hatrick welcomed all and Bill introduced the floor staff, daughters Amanda and Christy, and others. 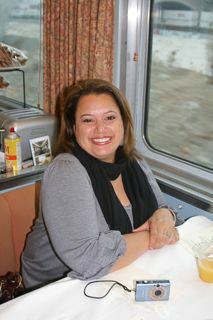 My authentic-looking ticket (below), issued at the train so I couldn't lose it! 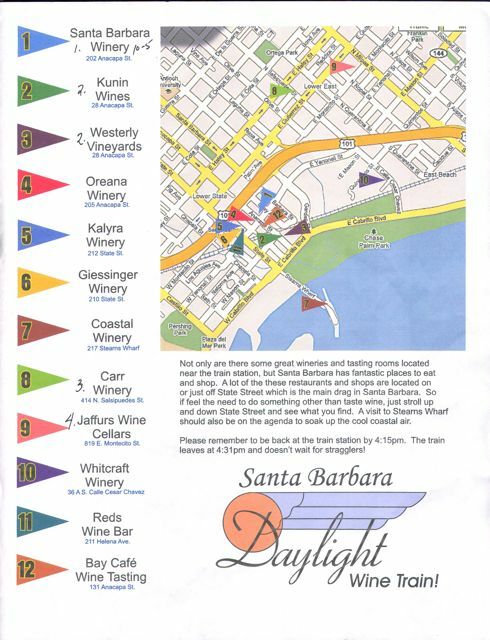 Tom Anderson, the Wine Tour Guy, provided an excellent map of the many wineries within walking distance of the Amtrak Station. 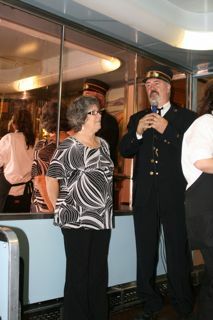 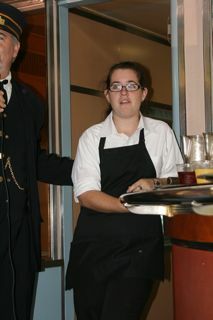 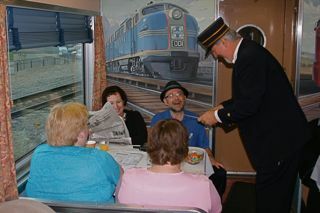 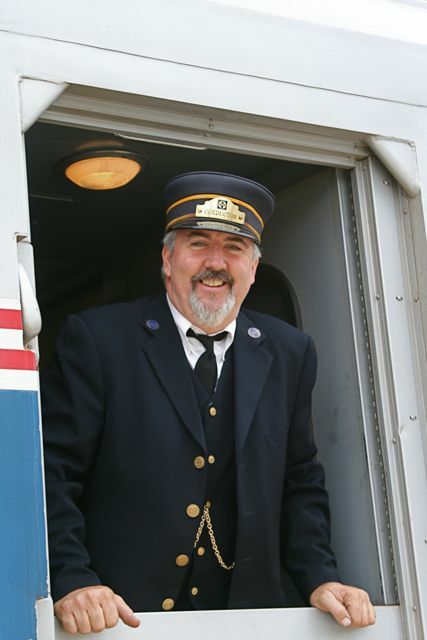 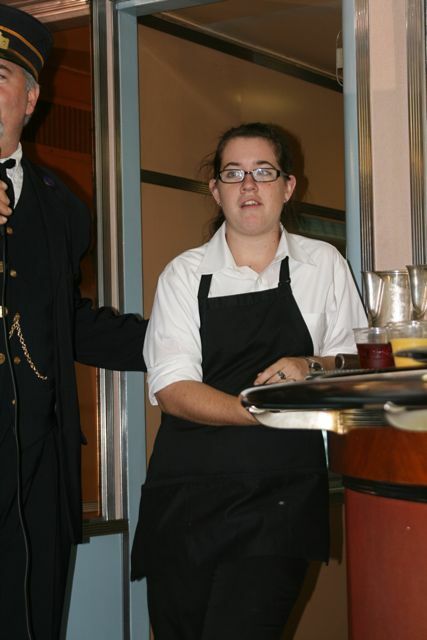 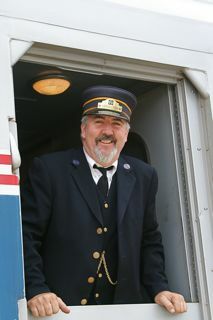 "Conductor Bill" made the rounds punching tickets and welcoming all the guests as the staff offered morning beverages and prepared a buffet breakfast. 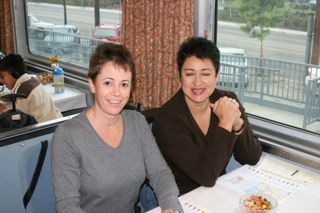 Guests enjoyed morning beverages and taking each others pictures as we pulled out of Los Angeles for Santa Barbara. Barbara Cepinko, Steve Grande (TrainWeb.com) and Conductor Bill discuss railroad related wines from Loco Vino, with label photos by Yours Truly. 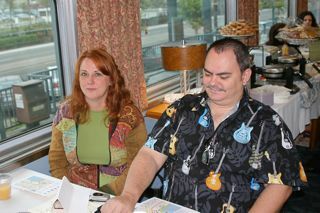 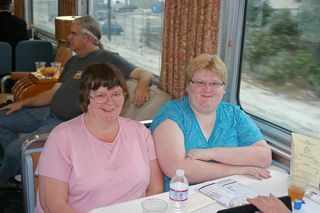 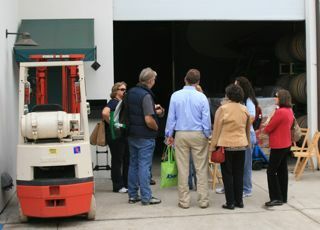 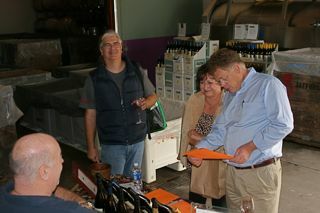 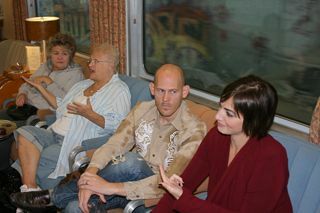 Steve Grande brought relatives from Litchfield, Maine, on the trip as part of a west coast tour he was taking them on. 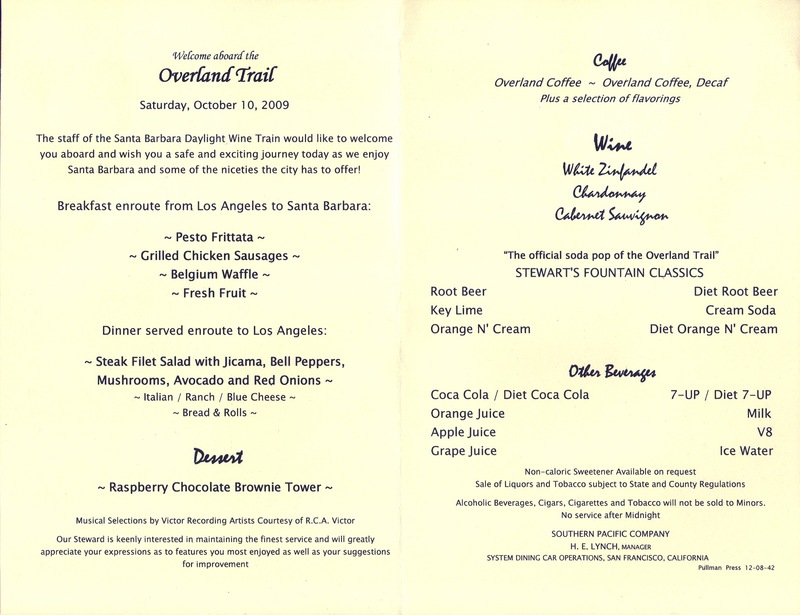 The Overland Trail Menu (above) looks like an antique menu, but it is the actual Menu for the day, printed just for this date. As we proceeded up the coast past Ventura, Tom noticed a southbound Surfliner waiting for us to pass. 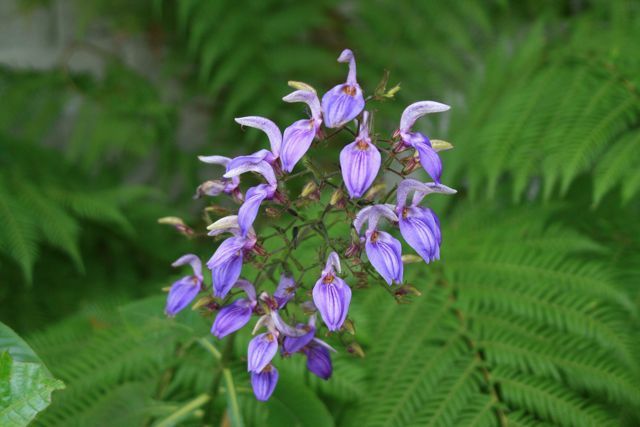 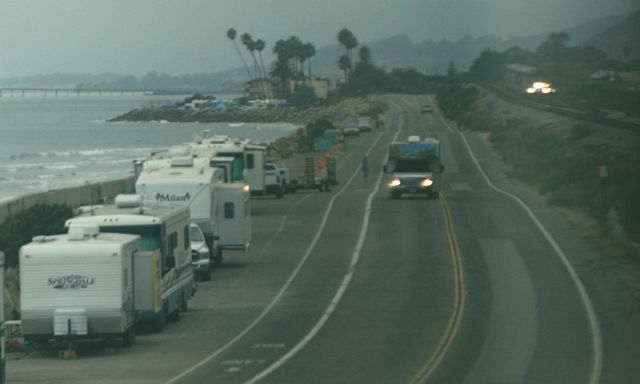 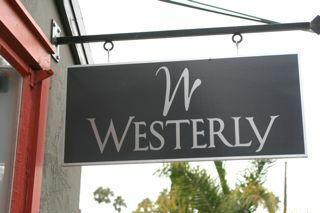 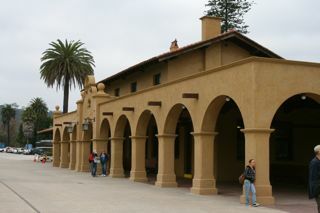 The weather became partly sunny in Santa Barbara. 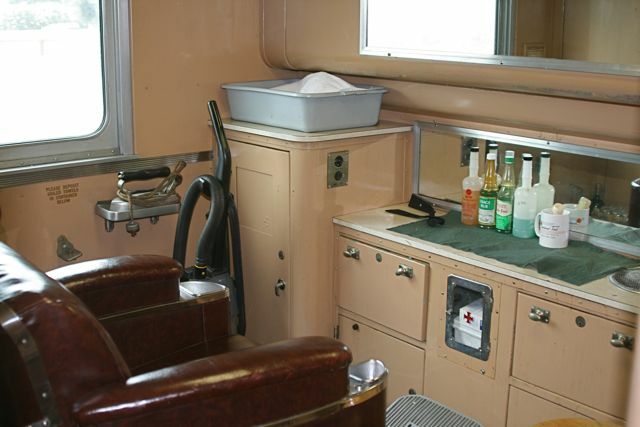 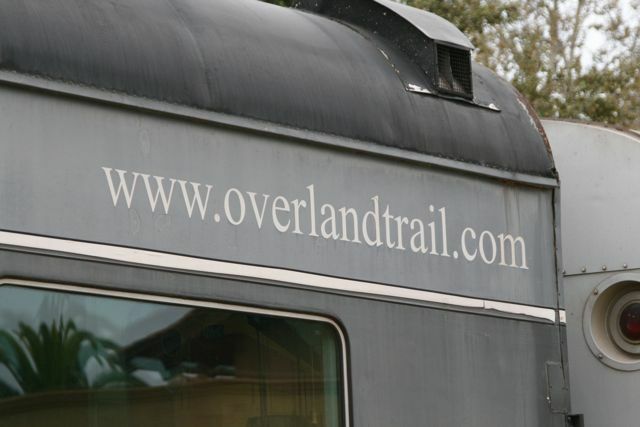 The Overland Trail has a unique barber shop. 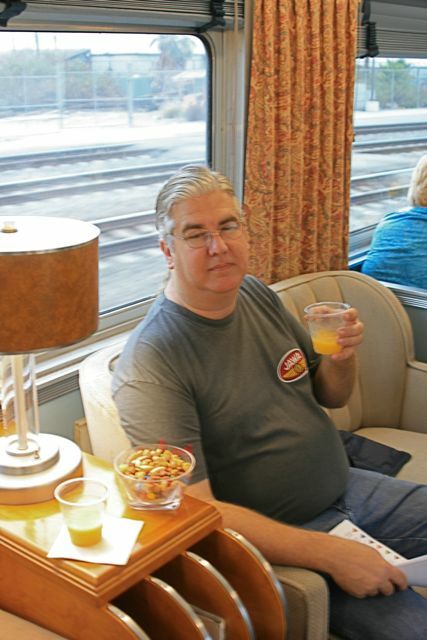 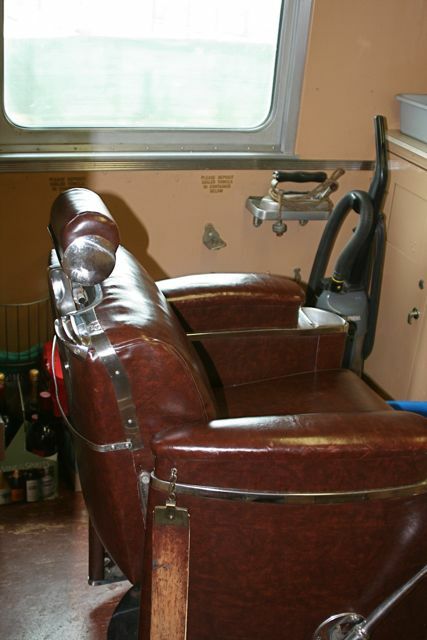 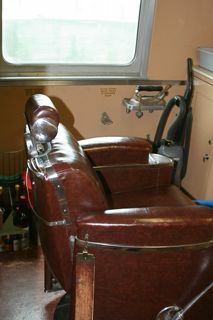 As Bill explained, businessmen traveled by train and needed haircuts before the next stop, days later. 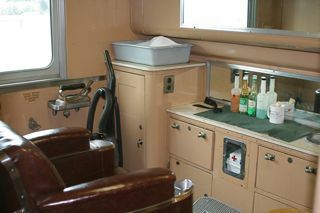 Notice the iron available for pressing clothes. 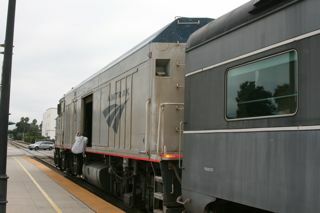 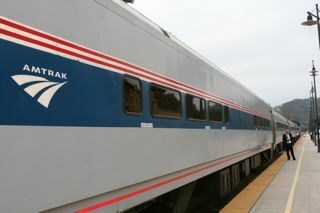 The Overland Trail was coupled into the consist in front of the trailing "Cabbage" (cab car/baggage) locomotive, at the end of the consist of single-level cars on this unique Surfliner. 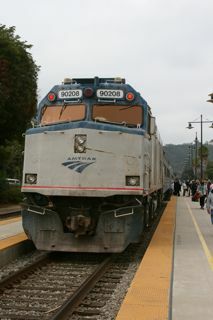 Our Surfliner #799 arrived in overcast, but dry, Santa Barbara at the scheduled time of 10:12 a.m. 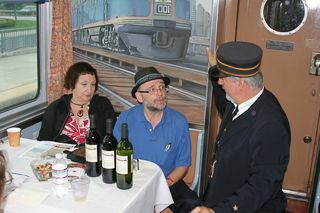 Guests detrained, took group photos, and a new, full complement of Overland Trail passengers boarded for the Central Coast Railroad Festival in San Luis Obispo, where the car would be part of the Celebration of Rail's History that would take place in SLO while we were tasting wine here in Santa Barbara. 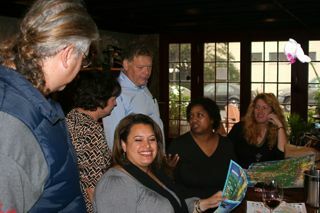 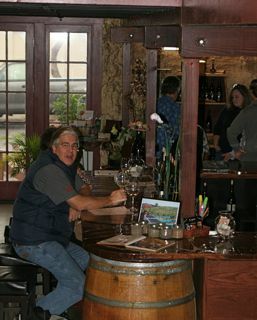 Tom prepares to lead the group to the only tasting room that opens at 10 am, Santa Barbara Winery. 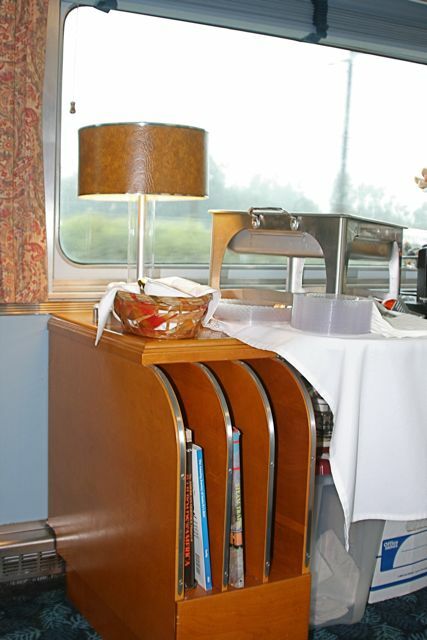 This single-level Surfliner consist is perfect for the Overland Trail because guests can enter the adjacent Amtrak car, then enter the Overland Trail which has no stairs of its own. 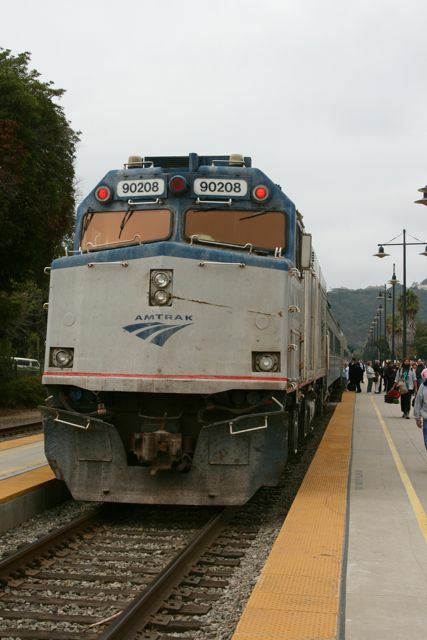 Since no Amtrak employee came to the baggage car to retrieve this fellow's bicycle in Santa Barbara, he pushed the exterior rollup door button and retrieved it himself. 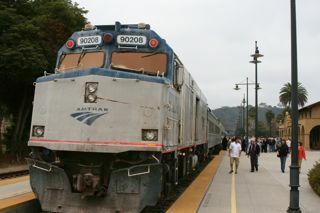 Soon #799 was headed on north to SLO for its 12:54 arrival. 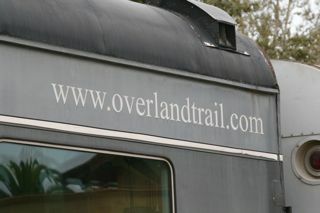 A new set of riders boarded the Overland Trail for a round trip. 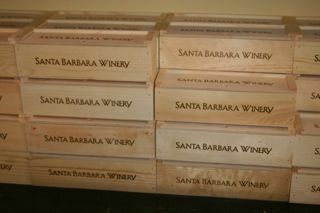 At 2 pm, it would become #792 and head back to Santa Barbara to pick up us Wine Tasters. Map by Tom Anderson, Wine Tour Leader. 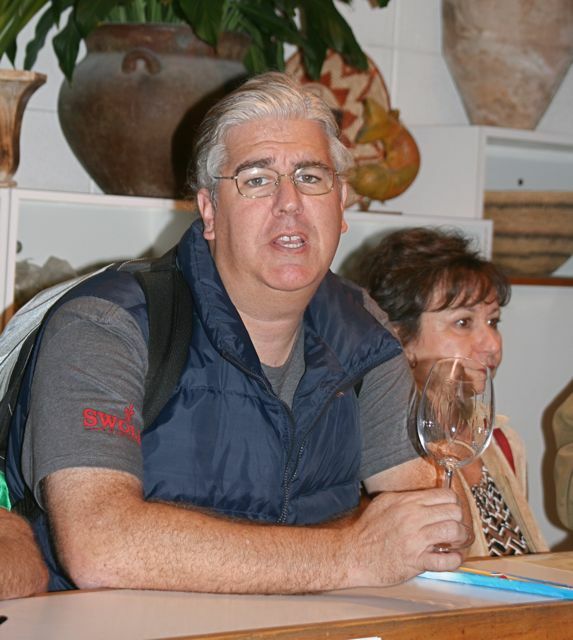 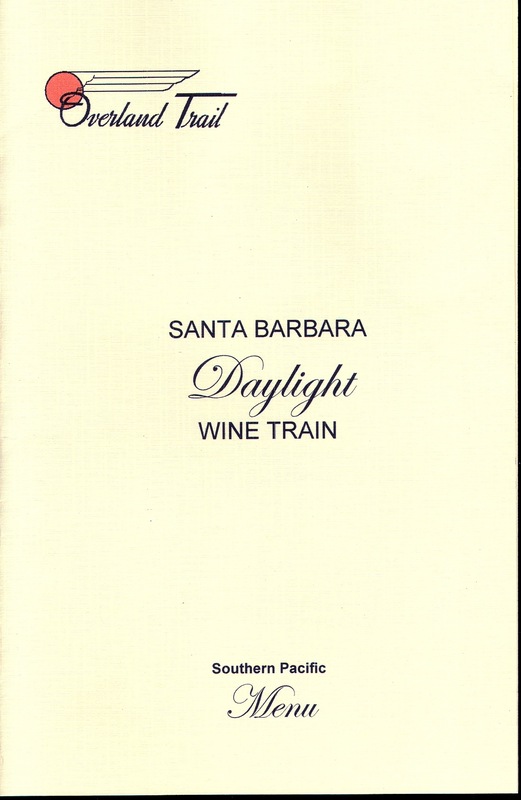 If you join this Daylight Wine Lover's Train in the future, let Tom Anderson, the Tasting Guide, know your wine interests and he can tell you which wineries to go to, since you probably will not go to all 12. 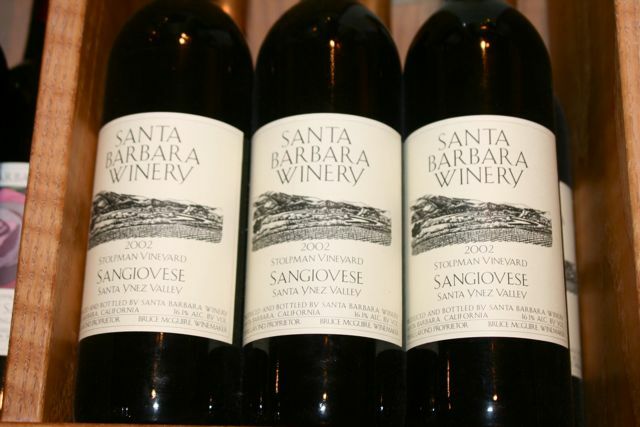 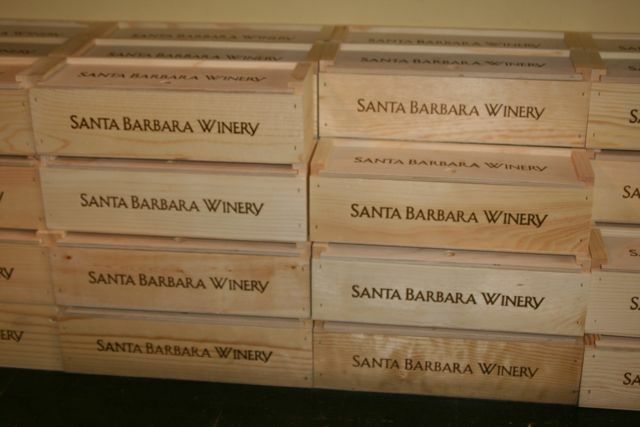 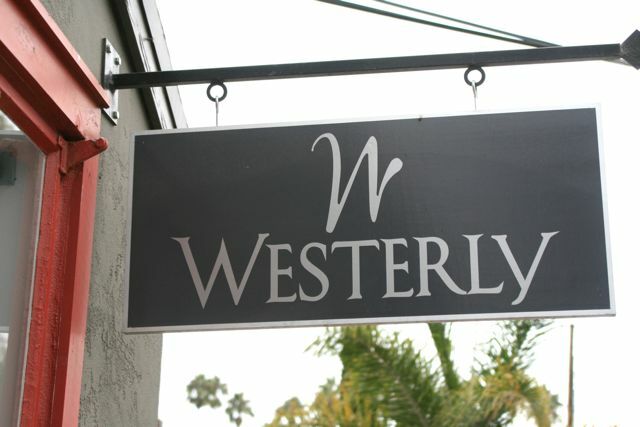 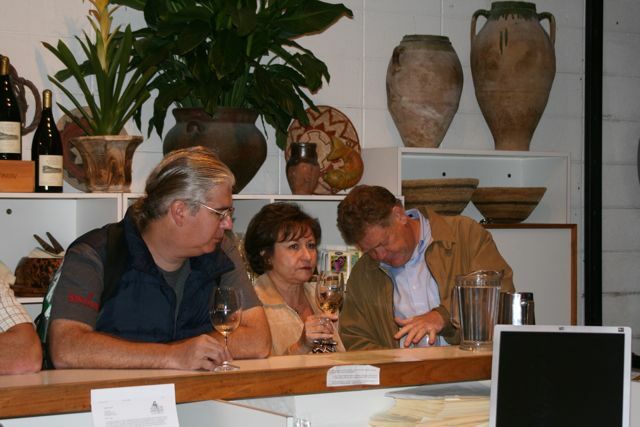 He knows his wines and what is being tasted at each Winery, and can save you some time and make your Santa Barbara visit more enjoyable. 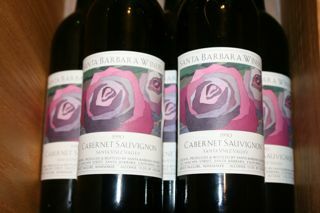 Even though his and my favorites differ, he still knows where I can find what I like. 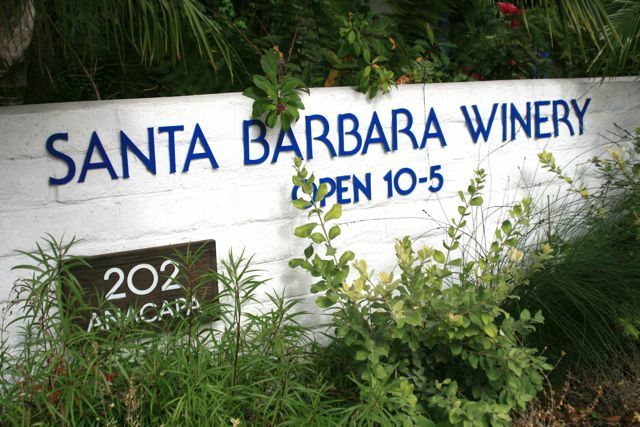 Because of their early opening hour, Santa Barbara Winery was our first stop, one block from the Amtrak Station on State Street. 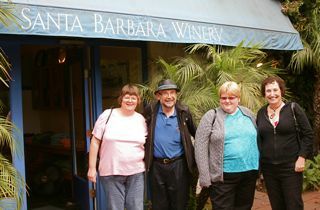 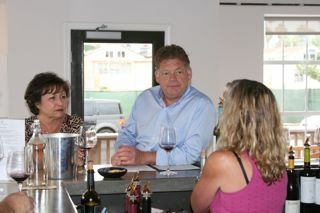 "St. Barbara" Cepinko (right) was happy to taste at the Santa Barbara Winery with Steve, his sister and niece. I hung out with these 3 for the day, all knowledgeable wine tasters. 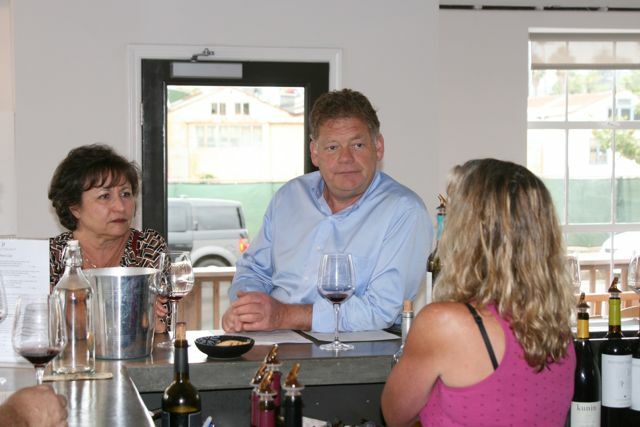 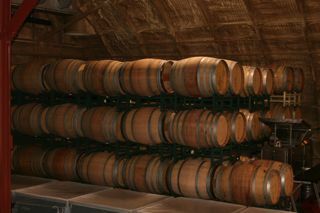 In addition to opening first, the Santa Barbara Winery has a very large tasting bar with many pourers, plus a large gift shop and wine store, so everyone can be accommodated from the train. The Santa Barbara Winery has the nicest gift shop and patio seating area of any winery we visited. 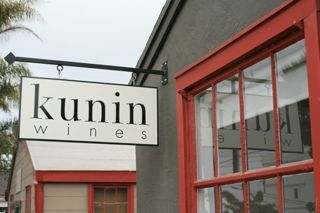 Next door Oreana Winery was still not open, so we walked toward the beach on Anacapa St.
Our second Wine Tasting stop was most convenient, both the Westerly Vineyards and Kunin Wines share this tasting room. You can choose to taste either or both wineries' selections at one stop. 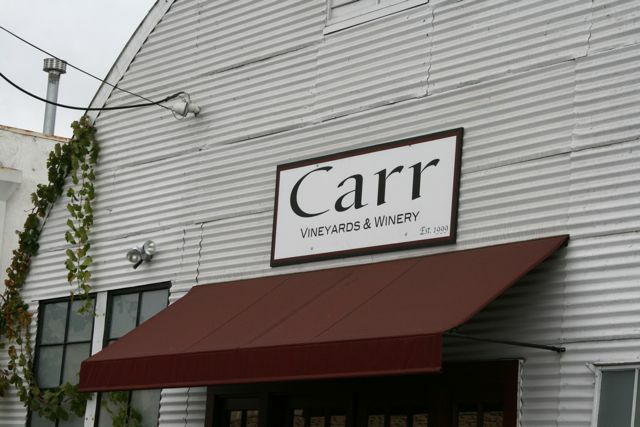 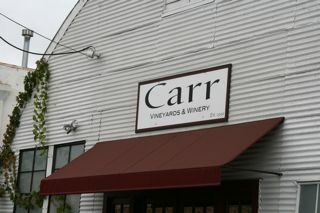 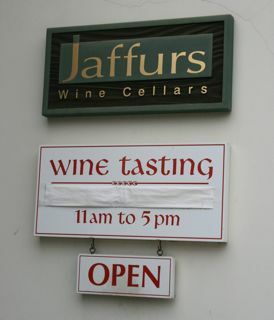 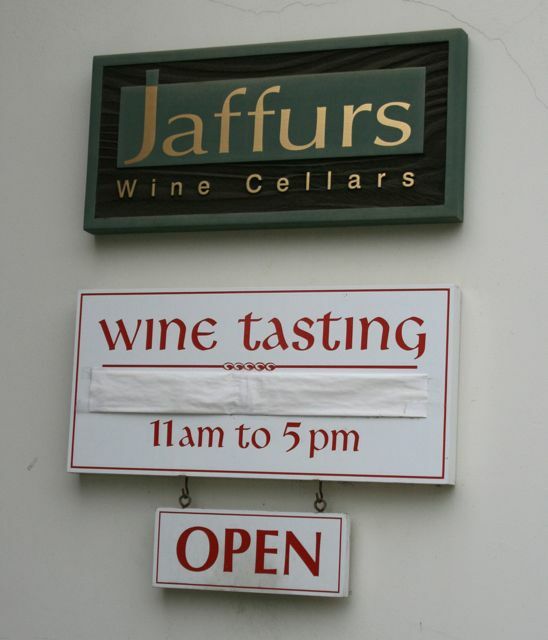 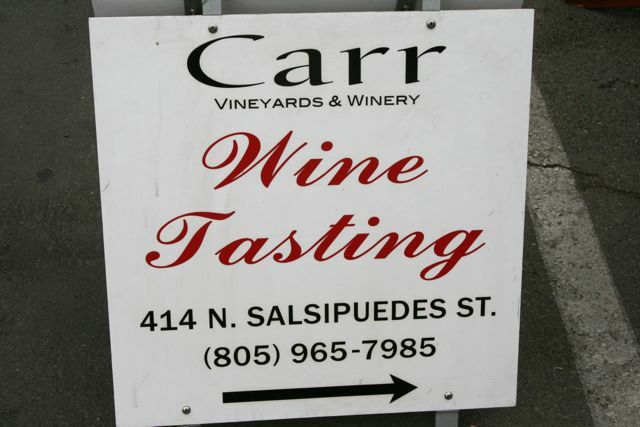 Next, we ventured to the two furthest wineries, of the 12 listed, from the train station that were on Tom's map, Carr Winery and Jaffurs Wine Cellars. 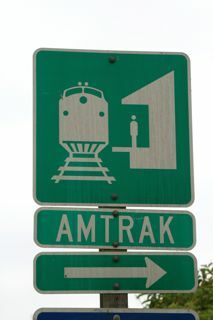 To get there we walked east to Garden St., north under Hwy. 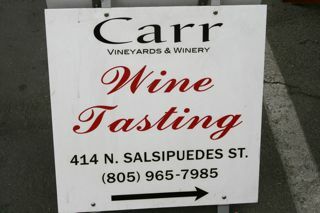 101, and east on Guiterrez to the Carr Winery. 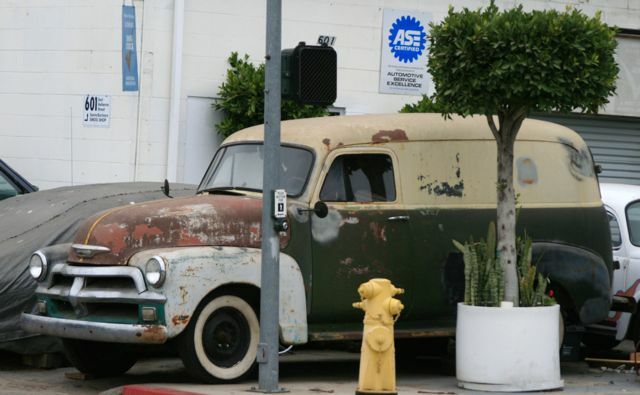 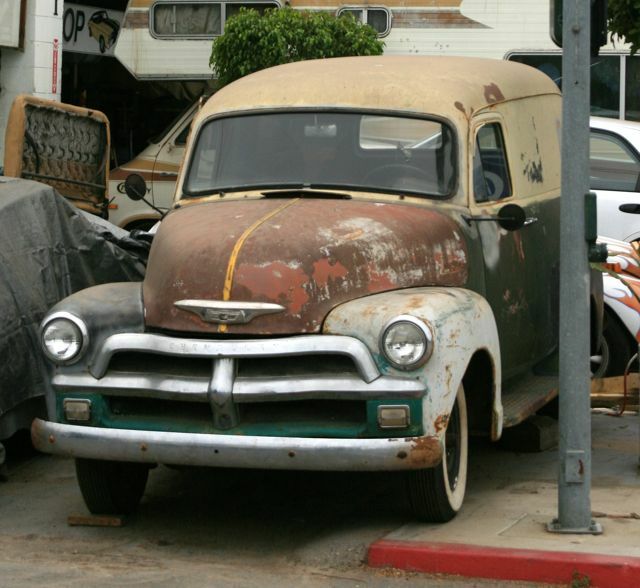 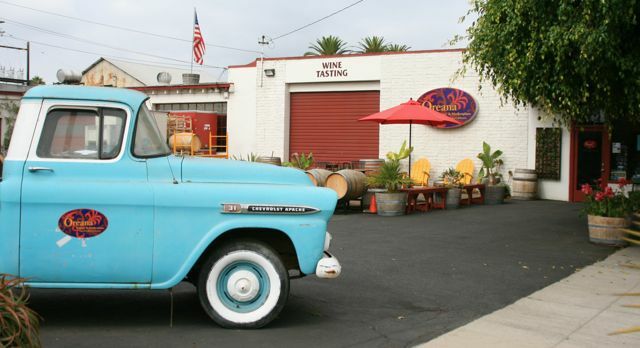 Heading from Carr to Jaffurs Wine Cellars, we passed a garage with a 50-something Chevy sedan delivery out front. Which was the original color?! We were not the only one to notice the old Chevy. 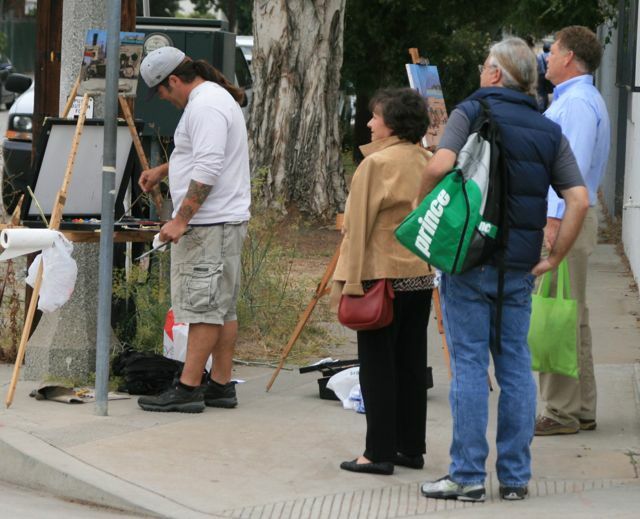 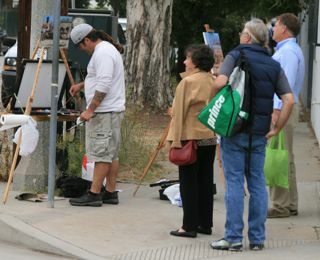 This fellow was giving painting instruction to an art student. 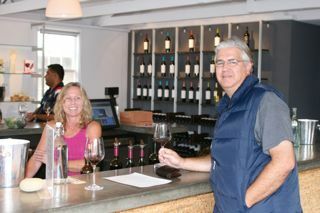 ... the most 'stellar wines' according to my knowledgeable tasting partners. 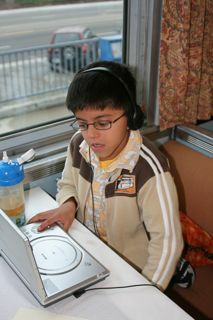 It was time to head back to the Amtrak Station, and have lunch at the Bay Cafe on the way. Upon my return to the station, the information sign was flashing, "#792 Delayed by Train Congestion." I thought they could just administer a dose of decongestant and get back on schedule! As it turned out, it was only 3 minutes late getting back to Santa Barbara. 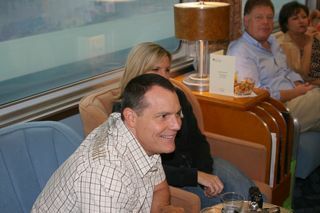 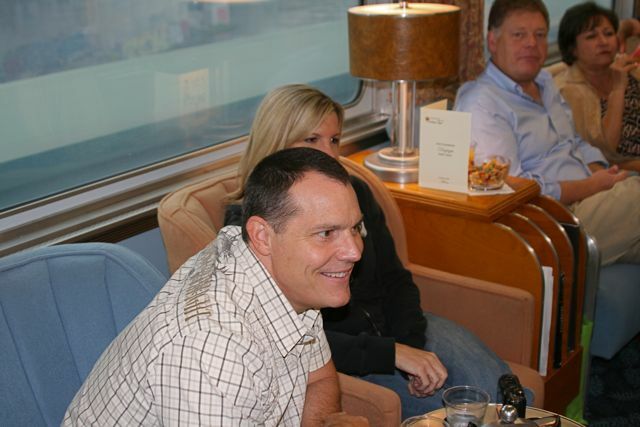 Bill escorted the guests off and boarded our group for the afternoon trip back to Los Angeles. We met our stations on time and watched the sun set in the west and the lights of Los Angeles appear. 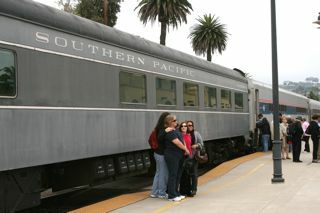 Since I had taken the 5:50 a.m. bus from Fullerton to the LA Station, which could also be caught at 5:30 a.m. in Santa Ana. 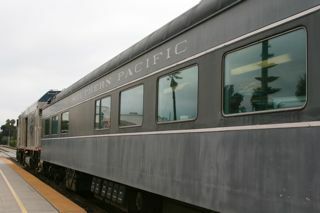 I wanted to meet the 7:15 p.m. Surfliner #590 in LA back to Fullerton. The arrival time for our train was 7:15, the exact time for the departure of the Surfliner, but they would be across the platform from each other. If we were a few minutes late, the Surfliner would not be there and the next train south, #592, was at 8:30, with no Metrolink on weekends! We arrived about 10 minutes early! So I stepped onto the Surfliner #590 and arrived back in Fullerton at 7:30, despite a train inspection at Hobart Yard when a detector triggered a wide load reponse, which was not true. What a great day riding the vintage Overland Trail, and being treated like royalty by Bill and Debbie Hatrick and staff, and tasting award-winning wines in Santa Barbara. 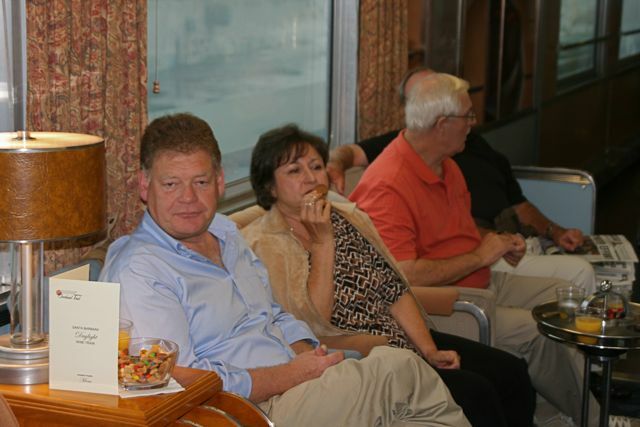 That's this reporter's response to Bill's request that if we were satisfied, to let others know. 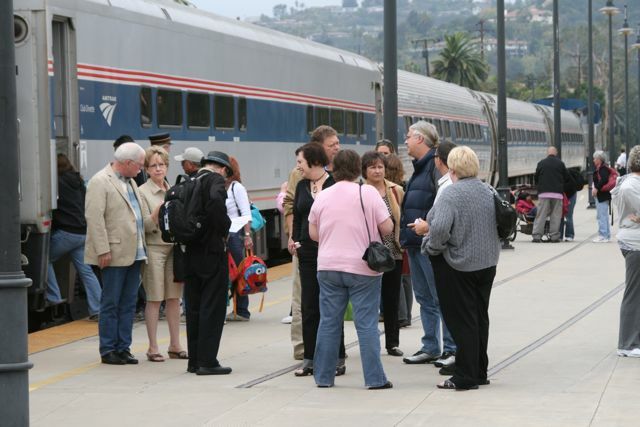 Don't hesitate, their trips sell out early!